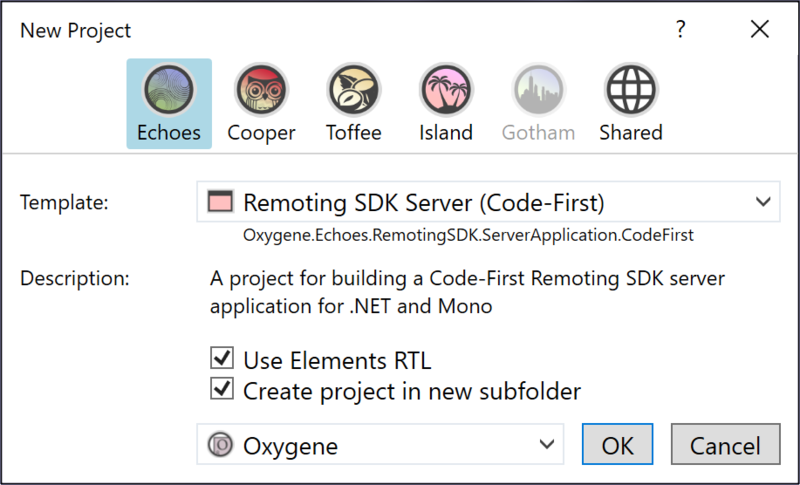 Remoting SDK provides templates to create .NET-based Remoting SDK Servers using Oxygene, C#, Swift and Java in Water. Fire includes these templates out of the box, and Water gains them after Remoting SDK is installed. 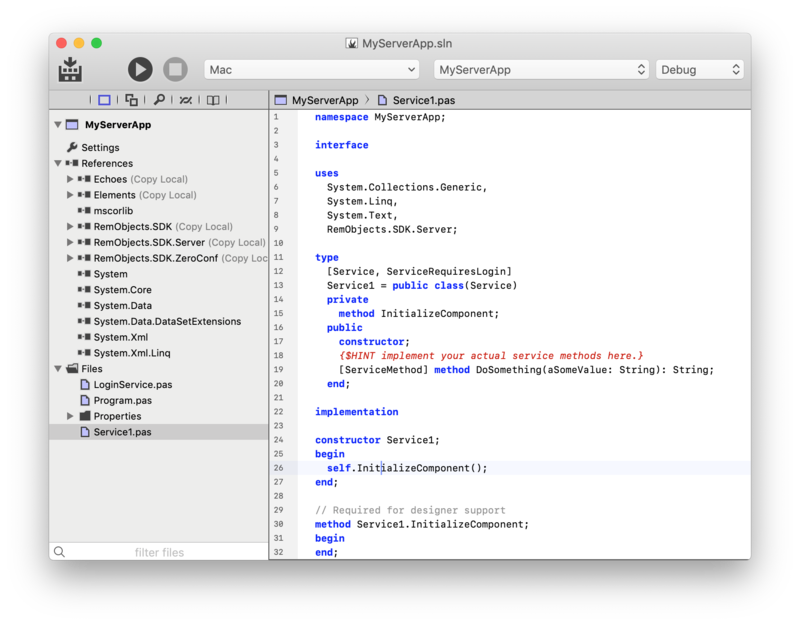 Fire supports only the more-modern Code-First server type, since Service Builder is not available on the Mac for editing .RODL files. 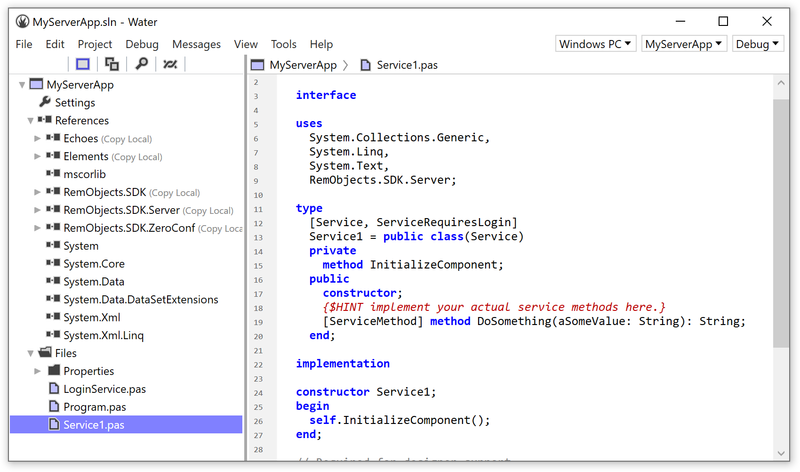 Note: Fire includes trial binaries of Remoting SDK for .NET. If you do not have a full version of RO installed, the trial version will be used, and invoking the wizard starts your 30-day trial period. 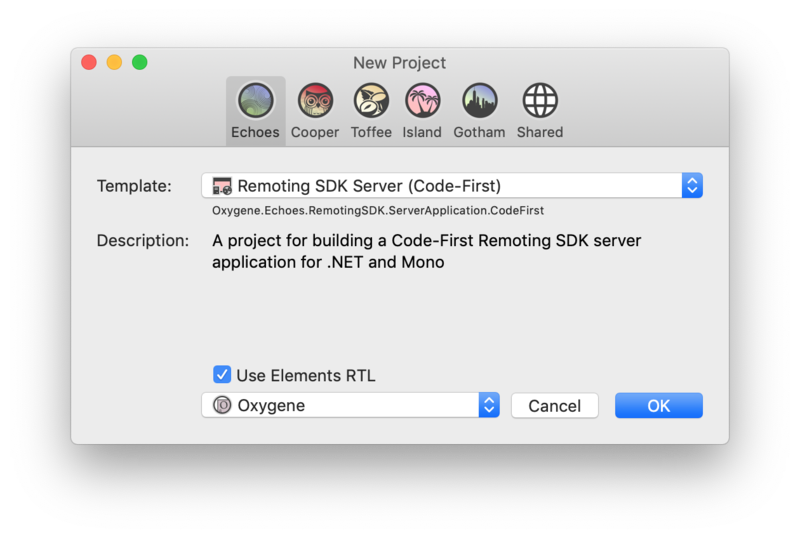 See also Installing Remoting SDK in Fire. The Program source file contains your server's Main() entry point. This is where execution will start when your server app is run. By default, it will create a new ApplicationServer instance, optionally configure it, and call Run() to activate the server. The call to Run() will block and keep your app running until it gets terminated manually. Depending on your platform and how your app is invoked, Run() will automatically launch your server in the right mode – for example as Windows Service or UNIX daemon, or as standalone GUI or command line application. You can read more about this in the ApplicationServer topic. In Fire, running your server app will use the command line mode by default; from Visual Studio it will run in windowed mode. This file includes your first Service, with a dummy method, and all the right annotations to make the service public. The service is also marked as requiring a login (more on that below). Chances are you will want to rename this service to something more sensible than Service1 and also change/replace the dummy method to add the actual functionality you want to expose. The LoginService is a second service added to your project by default to let your clients authenticate before accessing the other service(s). This service implements a Login method that takes a username and password. To start with, it just compares the two and accepts any login where the username equals the password. It goes without saying that you will want to replace this with functionality that verifies actual user accounts using whatever login scheme you want to use (for example a users database, or an LDAP directory). You can read a lot more about this in the Authentication and Login topic, and you will also want to check out the topic on Session Management. If you don't need authentication for your server, simply remove this class, and also remove the ServiceRequiresSession attribute from Service1. Simply build and run the project, and your server will be active on your local machine, on the default port 8099. To test it, open a browser window and enter https://localhost:8099 as address – you should see the welcome page of your server. You can change what Channel(s) and Message(s) your server is accessible under, either by changing the code in Program, or by adding a server configuration section to a *.exe.config file you place next to your server. By default, the server will use the IpSuperHttpServerChannel (which is compatible with both SuperHTTP and regular HTTP clients), and the efficient BinMessage format. You can change this, or add more messages easily – for example adding SOAP support to allow access from third party clients that don't use Remoting SDK.